Last weekend I noticed that one of my favorite buildings had come down. While driving down 40, I glanced towards the Armory and saw a large lot of dirt to its south instead of the corrugated-steel warehouse that was there last time I had looked. I admit that the building was not an architectural marvel, or even particularly attractive, but I loved it. 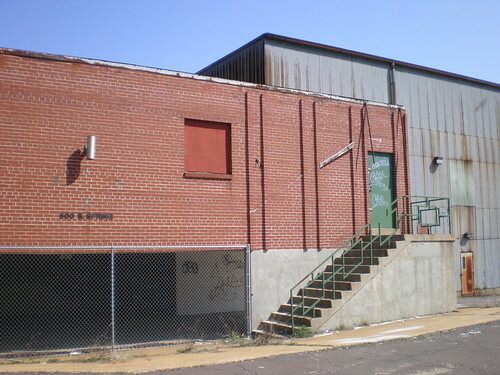 With its ring of graffiti underneath the large letters announcing its former tenant, this building told the story of the area now and in the past. It had me imagining what it was like alongside the train tracks running through the middle of the city when they were alive and productive here. 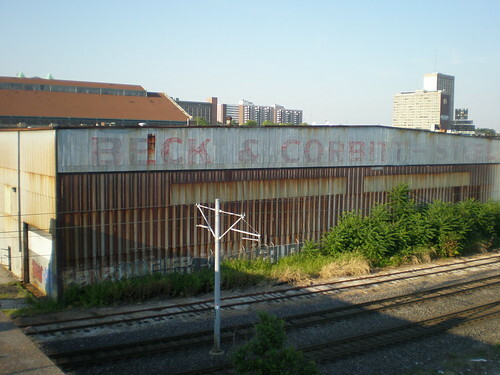 Only two blocks south of Market Street and directly on the tracks, this was a prime location. In addition to all of this, the building had a small feature that really attracted me to it. 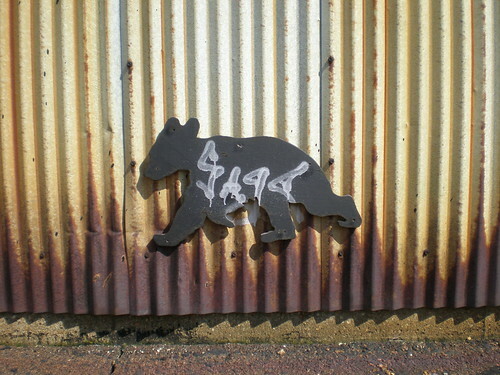 This Bear (or Badger as I have always called him) was on the West side of the building. I will miss it. 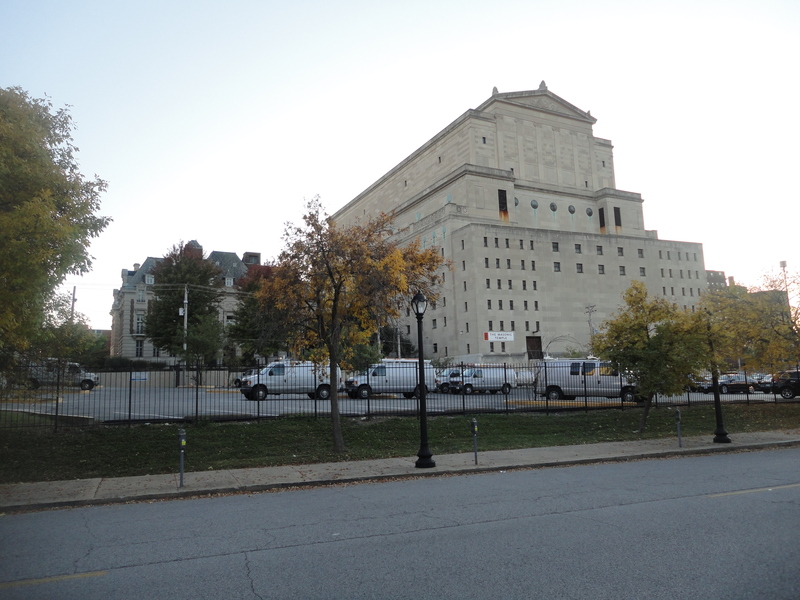 I originally speculated that this would be the site of Metro’s new Park and Ride lot for the new Scott Transit Plaza, but was corrected by Jennifer from NextStopSTL (Thanks!). Unfortunatly, I still don’t know why this block was raized. Maybe the land is going to be used by whoever is in the former May Company Warehouse that sits across Spring. A couple google searches taught me that the Million square foot warehouse sold by Macy’s last year for 2 million dollars has at least 2 tenants now: Hazzard Moving and Storage, and Warehouse of Stuff. Hopefully this land will be used productivly for those tenants or maybe for some future plans for the Armory (wouldn’t that be cool?). I guess I’ll just have to wait and see what happens, but whatever it is, I won’t forget what was here before. I really wish progress didn’t have to be so destructive. 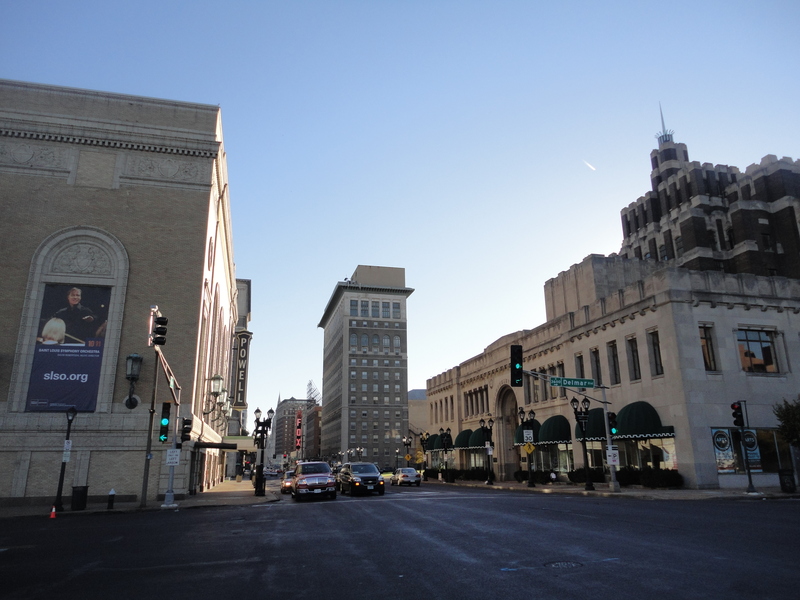 Grand Center is one of St. Louis’ coolest areas, but has some pretty bad problems. I would say the that the biggest problem is one shared with Downtown and other city neighborhoods: it can’t keep people around after events. People drive in to see shows at The Fox, The Sheldon, Powell Hall, The Black Rep etc., and then hop right back into their cars and drive home. Some do have a bite to eat at Kota Wood Fire Grill, The Best Steak House or the new City Diner @ The Fox before hand, but theater/concert patrons only add business for the hour or two directly preceding their show. 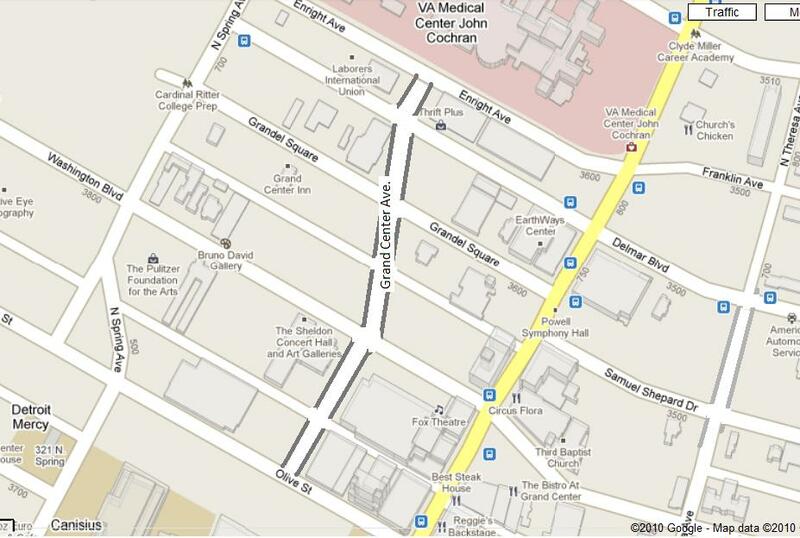 Looking at a map of Grand Center, the explanation for this phenomenon is pretty obvious. Although the view from Grand is wonderful, most of Grand Center is made of parking lots. The only thing to do is park and then leave. 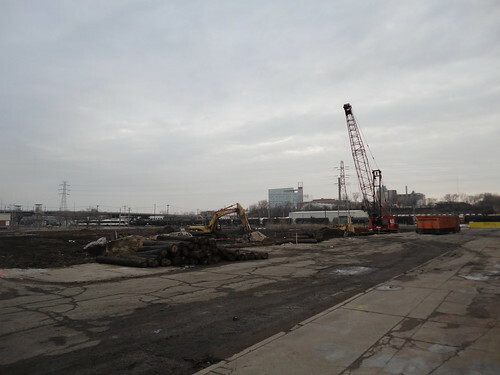 For Grand Center to be the entertainment destination that it could be, the parking lots must be replaced with something! Clearly parking is necessary, but surface is not the answer. We need some parking garages with stores, bars, restaurants and clubs on the first floor and we need mixed-use infill everywhere else. To make this task easier and reduce the amount of land in need of development, I propose adding a North/South street in between Spring and Grand from Olive all the way to Enright. A little bit of Google investigation yielded more about the drink than the alley, but proved quite interesting nonetheless. Apparently the Highball had been invented in Grand Center at the University Club during the late 1800s, and had become a very popular drink at the area clubs. Somehow, over time, the streetcar conductors changed the name of their stop along this stretch of Olive, from the St. Louis Club stop to Highball Alley. This spot, that was once popular enough to have its own name and streetcar stop, is now a pair of surface parking lots. 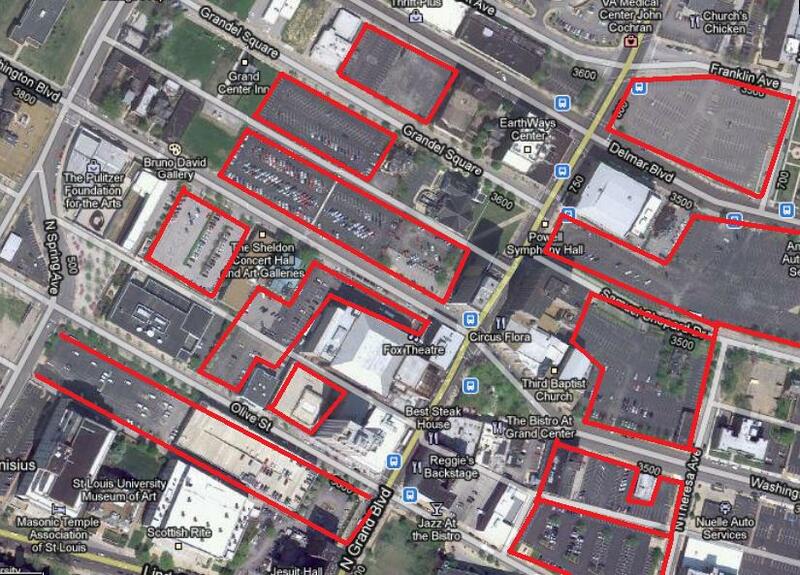 I think that Grand Center’s revitalization would get a huge boost from the creation of an extended High Ball Alley. Doesn’t it sound like a great place to meet for a drink?